Enter, and keep my heart. Author — Charles Wesley (1707-1788) was the original author of the lyrics to this hymn. The “Hymns of Dawn” Hymnal contains four of the original five verses of this Hymn (“Full Surrender,” No. 14), with some word modifications. Ephesians 4 (ESV) — “(22) to put off your old self, which belongs to your former manner of life and is corrupt through deceitful desires, (23) and to be renewed in the spirit of your minds, (24) and to put on the new self, created after the likeness of God in true righteousness and holiness. “Trust in the Lord and do good: so shalt thou dwell in the land, and verily thou shalt be fed. Delight thyself also in the Lord; and he shall give thee the desires of thy heart. Commit thy way unto the Lord; trust also in him, and he shall bring it to pass; and he shall bring forth thy righteousness as the light, and thy judgment as the noonday. Rest in the Lord and wait patiently for him.”—Psa. 37:3-7. 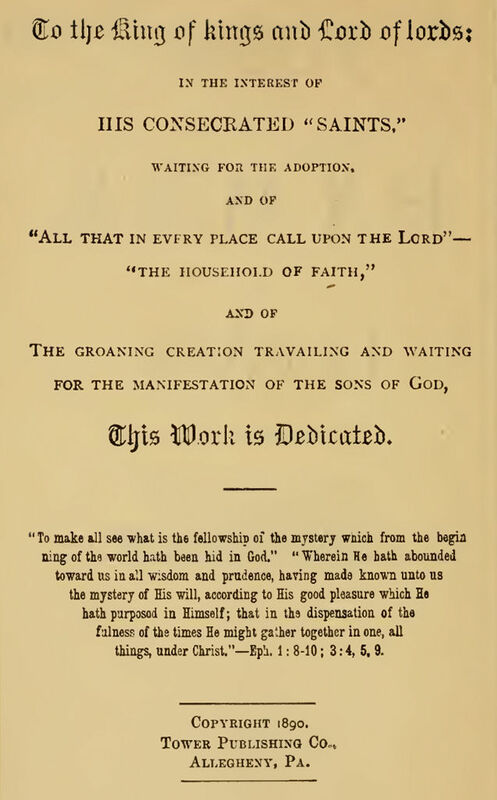 WHILE the Word of God abounds in precepts and admonitions, in warnings and instructions, and while it lifts high the standard of moral excellence—so high that in our weak and fallen condition we cannot attain unto it, and in our efforts to do so in the midst of a crooked and perverse generation we must of necessity encounter the wrath of all the powers of darkness strongly entrenched in the hearts of fallen fellow-men, this same blessed Word comes to the faithful children of God in the very midst of this battle of life with sweet and refreshing consolation [comfort, solace]. Oh, you who have never enlisted under the banner of the cross, you who have never made an honest endeavor to withstand the powers of darkness, to fight the good fight of faith, to stem the current of your own fallen nature’s tendencies, or to contend earnestly for truth and righteousness in the midst of a crooked and perverse generation, what can you know of the sweets of divine consolation? that is consolation, divine consolation, the only consolation that has any virtue of healing and refreshing in it. But it is reserved only for those noble souls who are faithfully bearing the burden and heat of the day; while those who listlessly drift with the current of the world’s favor, and of the downward tendencies of the carnal nature, can never have an intimation of its sweetness. How strong is the Lord, how wise and good! His promises have never failed to those that put their trust in him. Let us endeavor to make straight paths for our feet, lest that which is lame be turned out of the way, and then lay hold of the Lord’s strength to help us pursue our course in the narrow way of difficulty and trial. The fact that we are weak and lame does not separate us from the love and power of God; for “he knoweth our frame, he remembereth that we are dust.” He knows that we have the treasure of the new nature in earthen vessels, and therefore it is that, while we strive to overcome, we have his proffered sympathy and aid and the imputed righteousness of Christ for our all-sufficient covering. “Trust in the Lord and do good; so shalt thou dwell in the land; and verily thou shalt be fed” (Psalm 37:3). Our food and shelter will be sure: he will never leave nor forsake his own, but will make all things work together for good to them [Romans 8:28]. “Delight thyself also in the Lord, and he shall give thee the desires of thine heart” (Psalm 37:4). This delight in the Lord is a still more advanced step in the Christian life. It is a blessed thing to learn to trust in the Lord; but it is when continued trust and responsive providences have ripened into personal acquaintance and fellowship with God that we learn to delight in him. Yes, it is when heart answers to heart, when pleading prayer brings recognized answers of peace, when the divine care and love are specially seen in the guidance of our way: in a word, when we come to feel that the Father and the Son have so clearly manifested themselves to us that we can recognize their abiding presence with us. Ah! then it is that we begin to delight ourselves in the Lord. Then, however dark may be the way, or however heavy may be the storm that rages about us, the balm of divine consolation is always there, so that the child of God, though often troubled on every side, is not distressed; though perplexed, he is never in despair; though cast down, he is not destroyed; and though persecuted, he is never forsaken. To delight thus in the Lord is to have the affections centered in him; it is to have the heart in such sympathy with righteousness and truth as to see in God the fountain of all goodness and truth, the one altogether lovely. The Psalmist expresses such an attitude of heart when, personifying our Lord Jesus, he said, “I delight to do thy will, O my God: yea, thy law is within my heart.” And again, “O how love I thy law! It is my meditation all the day.” And again, when he says, “O God, thou art my God; early will I seek thee: my soul thirsteth for thee, my flesh longeth for thee in a dry and thirsty land where no water is….Because thy loving kindness is better than life, my lips shall praise thee….My soul shall be satisfied as with marrow and fatness, and my mouth shall praise thee with joyful lips when I remember thee upon my bed, and meditate on thee in the night watches. Because thou hast been my help, therefore in the shadow of thy wings will I rejoice. My soul followeth hard after thee: thy right hand upholdeth me.”—Psa. 63. And how precious is the promise to those who thus learn to trust in the Lord and go on doing good, no matter how obstinate or fierce may be the persecution it may excite, and who delight in the Lord and confidently commit their way to his loving wisdom. Surely they shall have the desires of their heart, and no good thing will he withhold from them. Their fervent prayers avail much, and in his own good time their righteousness, however misrepresented and evil spoken of now, shall be brought forth as the light—clear, cloudless and widely manifest; and their judgment, the justice and righteousness of their hearts, as the noonday. And even while we remain here as aliens and foreigners in the enemy’s land, verily we shall be fed, both with the temporal bread and with the bread of heaven for our spiritual sustenance. Blessed promises! and, to the praise of his abounding grace, his saints of the past and present all bear ample testimony of their fulfilment. Ever flows our thirst to assuage?